For the first Tuesday of December, Fannin took on the Dawson County Tigers for their first region matchup. 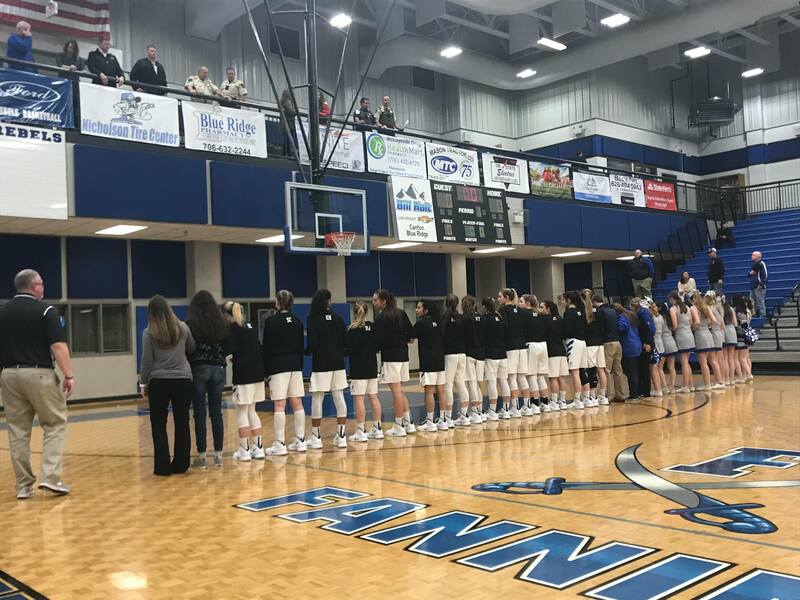 The Lady Tigers traveled to Fannin County in hopes of redeeming themselves from a previous loss while the Lady Rebels hoped to do the same. Fannin was able to earn an early lead in the first quarter with their quick passes up the court. Rebel senior, Maleah Stepp, led Fannin in scoring with twelve points for the night, all being three point shots. Dawson’s point guard who has committed to Clemson University, led the Lady Tigers with twenty-three points overall. Dawson claimed a 16-10 lead over Fannin to close the first quarter. The Lady Tigers had a scrappy defense where they made steals and fouled the Rebels. Sadie Collins was on fire at the free throw line where she made six of her nine shots for the night after the four points she contributed on the block. Freshman, Becca Ledford, was right behind Collins as she shot six free throws and made four. Kennedy Harper was one-hundred percent on her free throws where she made her two out of two and went on to add two more points to Fannin’s score. As Fannin made foul shots, Dawson earned their points from three point shots. The Tigers extended their lead over the Rebels and went into halftime with a score of 37-20. The Rebels started to follow Dawson’s lead and pick up their three point game. Abby Ledford contributed six points to Fannin’s score with two three point shots. Junior, Morgan Holt, continued the trend and added four points to the board with one made three point shot and a free throw. As Fannin made three’s, the Tigers took advantage of a wide open lane and had a 55-32 lead to end the third quarter. As the clock started to wind down in the fourth quarter, Fannin started to get into foul trouble. Olivia Sisson drew her fourth foul as she made a shot on the block and added onto the Rebels score. Senior, Reagan Henderson, fouled out of the game after she made a jump shot for Fannin. Dawson closed out the game with a 70-44 victory, putting Fannin’s overall record at 1-6 and their region record at 0-1.